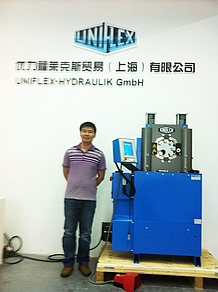 FLEXMAIL 02-2014 - Hose crimpers, hydraulic crimpers, Workshop crimpers, Production crimpers : UNIFLEX of America LLC. 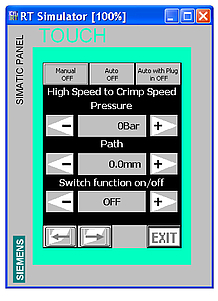 This new control unit for UNIFLEX products features a colour user interface with touchscreen functions for intuitive guidance. More standardized menus, as well as the ability to customize user interfaces and functionalities within every application represent new and highly labour-saving features. Another innovation is central control via HID (Human Interface Devices), i.e. using Windows devices. You can also document the quality assurance, and track product and machine data with the PFM (Pressure Force Monitoring) option. With this feature, you can compress smaller diameters needing force of less than 60 tons more quickly. 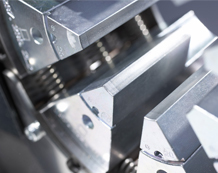 The additional option in the “switching point” menu lets you choose between the standard production process and the processing option for easily deformable materials, such as deformable couplings used for low pressure hoses. Without switching, the HM 220 moves/compresses at a rate of 9.5 mm/sec (at 6 mm/sec with a switching point). Watch your productivity skyrocket! The manually operated workshop press now has an ergonomically improved LED signal transmitter. The bright LED immediately and clearly informs the user the moment the correct crimp dimension is reached. The UNIFLEX HM 480 crimper is the perfect machine for crimping large bore industrial hoses and now offers even more value for our customers. With the addition of three new special crimping dies, this machine can be used to crimp 8”, 10” and even some 12” hoses. Due to HM 480's industry-leading opening travel of +150 mm, it is possible to crimp 8” hoses with couplings and fixed 8” ANSI-150 class flanges, and then pass the flange through the crimper without removing any of the crimping dies. Various water-type fitting ends, such as Bauer fittings up to 10”, can also be passed through the crimper without removing any of the crimping dies. The diameters of the new crimping dies are 8.67” (220 mm), 10.43” (265 mm), and 12.0” (305 mm). To give you an even better advantage over your competition and to keep your costs down, all of these dies are extended length dies at 8.67” (220 mm) long. Now you can crimp in a single stroke, saving valuable production time while meeting one crimp per fitting standards. Contact your local UNIFLEX sales representative for more information on these great new additions to the UNIFLEX range of products! Designed as a special solution for the HM225, this retrofit meets safety-relevant requirements. This special solution has safety glass panes with cut-outs (die-formed sizes) to prevent crushing injuries. Features include a safety switch and various sizes of Makrolon covers. For more information, contact your local UNIFLEX representative. Designed to meet the unique requirements of one of our customers, the tool has been rotated 90 degrees to maintain a minimum working height of 800 mm above the ground. While the drive unit has been separately designed, all other technical specifications are standard for the HM 480. UNIFLEX, represented here by Mr. Ye Hong Bo, is proud to present its new offices in Shanghai. The showroom now provides more space and thus a greater range of products, including workshop equipment and useful peripherals for all of your hose processing needs. In May 2012, the first stage of a major expansion and renovation scheme for the company building, originally built in 1996, was celebrated in Karben. The work comes in time for our company’s 40th anniversary. The production and logistics areas have been modernized so that they can better meet present and future demands. Following extensive and detailed planning, the second phase of the renovation began in July 2014. Extensive renovations and modernization work are underway to ensure that the building’s renovated administrative wing can cope better with the increased space requirements and the new technical possibilities. In addition to the new office, the layout of the rooms on each floor is being improved to give our employees in administration and sales more meeting rooms. Besides basic renewal of the communications and supply technology, the reception area will also be rebuilt and all the windows refurbished—whereby the entire facade of the renovated administrative building will have a new look. We are already looking forward to welcoming you to our new conference rooms—completion is expected in April 2015! Of course, throughout the renovation, we will be available, 100%, to respond to your needs. After 26 years, Karl has become an integral part of life and almost “part of the furniture” at our company, and we congratulate him on his upcoming retirement. His CV not only includes long-standing activity in Sales, but also Purchasing, where he oversaw custom machine construction. We will all miss the technical advice, energy and personal touch that he brought to the company. We therefore hope that he might become ever so slightly bored during his retirement (while riding around on his motorbike) and that he will return to his old stomping ground from time to time to help us with the odd problem and to bring along the delicious cakes his wife bakes. Mr. Peter Kaiser of the German production site in Karben will be taking his well-deserved retirement on 1 August 2014 after 18 years with UNIFLEX. Mr. Kaiser is one of the few people who can assemble all the machines in the UNIFLEX product range in a single operation. As a key member of the production department, he has experienced the production cycle of every machine, so that he knows nearly every nut and bolt. In his spare time, the former active footballer loves singing in a choir, and we are interested to know whether he will remain an active singer following his retirement, or even take up a new hobby. "We are pleased to announce that Ms. Zhao Xin has joined our team to provide support in administration and accounting", explains Lim Thye Ann, Administration General Manager, UNIFLEX-HYDRAULIK Asia Pacific. "With her wide range of experience in accounting, we are sure that she will support the growth of our branch office constructively and operationally," Lim Thye Ann adds.